After being vacant for nearly a year, a judge ordered a receiver to take over a blighted strip mall in Lemon Grove. 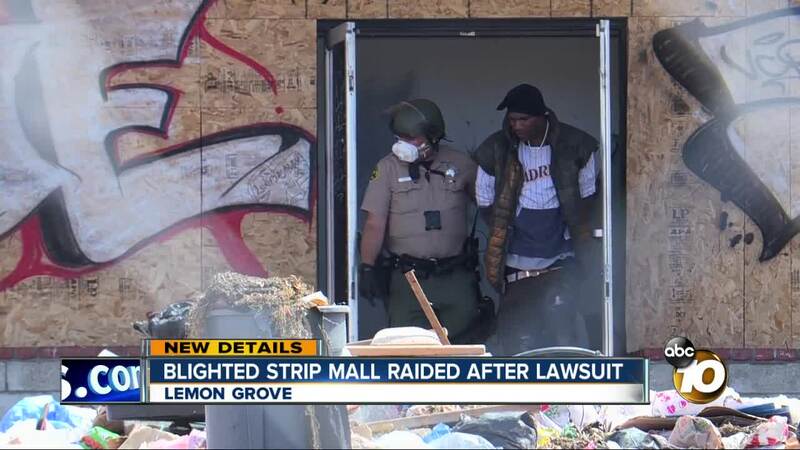 LEMON GROVE, Calif. (KGTV) - A strip mall that had fallen into disrepair and attracted squatters has been placed into receivership, according to the San Diego Sheriff’s Department. Located on the 7400 Block of Broadway, the property consisted of several buildings that had closed about a year ago after the city busted an illegal marijuana dispensary. But that’s when the real problems began. “Lots of police calls, criminal activities and police responses,” said Richardson Griswold, who was appointed as the receiver by a superior court judge on Friday. It came after the City of Lemon Grove had been granted a judgment against the owners of the property. The judgment required that the owners clean it up and properly secure it, but that was never completed. When the receiver arrived Friday afternoon, the Sheriff’s Department was called in to remove six people who had been living inside. One of them was found hiding in the attic. Four were taken into custody on existing warrants. He had already hired a crew to start clearing out the buildings and board up the access points. He said they will continue to rehab the property over the next few months.